Look pretty as a picture in this gorgeous navy blue floral print dress. Cut from a smooth, shantung fabric, this dress features a fitted bodice and skater skirt shaped into a dipped hemline. Fully lined, this dress has a zip fastening and comes with a matching belt to cinch you in at the waist. Ordered this dress last night and it arrived this morning. I am 5’10”. It fits perfectly, I ordered normal size. This dress is stunning. I do really like it a lot, but the shoulders doesn't site properly. Purchased this dress for a wedding and I’m delighted with the look. It’s very good value and looks elegant. A very happy customer. Gorgeous dress bought for my sons wedding. I can’t wait to wear it. Excellent quality. Just love it! I bought this dress for my sons wedding, along with the crepe edge to edge jacket, perfect, look and feel great!! Really pleased with this. Prompt delivery and dress is beautiful. Fully lined and nice quality. I’m going to need heels as only 5’3” but it’s just what I was needing for a wedding and races. Excellent service - really is next day delivery. Dresses good value. Very well made and a great fit. This is the first time i have bought from Roman and i will buy from them again. This is a lovely dress, beautiful design and well made. Unfortunately I have to return as did not fit across top. Lovely fitting dress, great quality ordered and it was here the next day. Lovely flowing dress for a forthcoming wedding. Great fit if your pear shaped. Absolutely delighted with this dress which I have bought to attend a wedding. The material is lovely and it is very comfortable. It lives up to the beautiful image in the photos. Beautiful dress, lovely material, it hangs so well. I don’t like the bow at the front, but will turn it around to hang down the back when I wear it to a wedding in August. Gorgeous dress. Material is lovely. I will just need to lift it at the shoulders as I'm a bit short waisted but love it. Got it for my godsons wedding in the south of France. Can't wait to wear it. I ordered this dress for a wedding in Thailand so I've not wore it yet but tried it on and it is gorgeous. 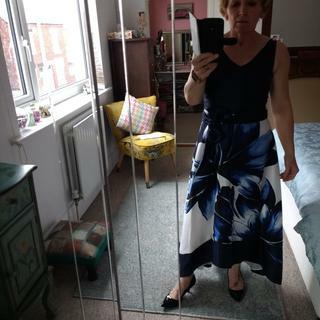 It is a bit long at the back, hangs over my shoes and I'm 5.5ft but I'm taking it to an alterations shop and hoping they can take the dress up slightly as I've tried other dresses and they just don't compare to this. The material feels very expensive and the skirt is stunning! Amazing on. - looks more expensive than it was. Love this. Bought it for my 25th wedding anniversary meal and also for two weddings. Lovely dress. Fits well, looks great and style is really good. Love the shape of the hem, will be a good summer "going out" dress! This dress looked even nicer than it did in the photo! Gorgeous material, lovely colour, fits & hangs beautifully! Really lovely dress.. perfect length at the back (I’m 5’7).. nice material & well finished. Looking forward to wearing it. The dress is exactly as seen on line. The material is a nice quality and dress well made. I bought it for my daughter to go to the races but the style is too old for her so I will be returning it. I would be confident to try this company again as I would have been pleased with my purchase if it had suited her . Just bought this dress for a wedding in August, bo you have a matching jacket or wrap? BEST ANSWER:Here are a few that may be suitable. BEST ANSWER:Unfortunately we don't provide a petite range. Our models are 5"9 so this would be slightly longer on yourself. Does the material have any stretch in it? BEST ANSWER:This dress is made from 100% Polyester and doesn't contain any elastane so this dress wont be stretchy.